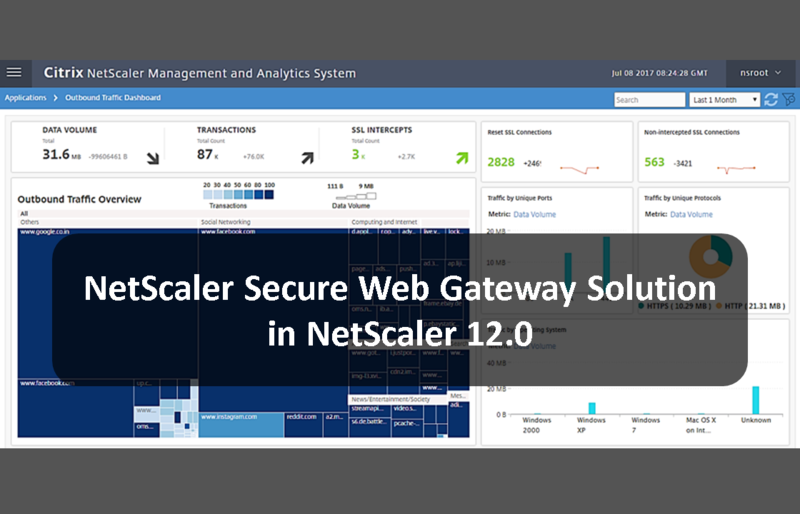 Citrix Announces NetScaler Secure Web Gateway Solution in NetScaler 12.0 – CT Link Systems, Inc.
Enterprises now are facing more and more attacks on their security from web sessions caused by their employees visiting compromised or malicious websites. Which in turn can lead to malware or botnet installations, data theft and event ransomware infections on your network. Even with web encryptions helping to keep things safer, there are now cases in which encryptions are being used to hide malware within your encrypted traffic. Encryption also means less visibility and control. Introducing the latest solution from Citrix’s NetScaler Security portfolio: NetScaler Secure Web Gateway (NetScaler SWG). NetScaler SWG solutionprovides Complete Visibility into encrypted traffic allowing security operations teams to inspect, analyze and control web traffic. NetScaler SWG solution acts as a forward proxy for all outgoing traffic enabling deployment of security policies with ease. NetScaler URL Threat Intelligence Subscription is a cloud-based service that blocks access to millions of malware and phishing websites. This subscription service is available as an add-on option to NetScaler SWG solution. NetScaler SWG solution with NetScaler MASprovides User Behavior Analytics based on user risk score. Organizations can Reduce their Business Risk and Increase Employee Productivityby protecting their employees against cyber security threats like phishing, and malware threats. Security Operations teams gain deep visibility and real-time user behavior analytics to protect against malware threats. Organizations can Ensure Corporate and Regulatory Policy Compliance. Organizations have the visibility and control they need over encrypted traffic while ensuring compliance with their privacy, regulatory and acceptable user policies. Organizations can Increase their Operational Efficiency by using singe pane of glass view for real-time visibility, analytics, and reporting. Single pane of glass view through NetScaler Management and Analytics System (NetScaler MAS) provides real-time visibility, analytics, and reporting. Within seconds drill down to a per-user web usage view to understand events and correlated threats. Learn more on Netscaler and other Citrix Products from our Product page or this article here! ← Reimagining your Business for the Future with CT Link Systems!